I have a lot of talented friends, but this one is making me particularly happy right now. I’m not a big ring wearer, but I practically pulled the ring off my friend Wendy’s finger when I saw her a month or so ago. I love the simplicity of it and it’s somewhat funky, but still sophisticated, look. The best part is, you get to choose what inspirational words you want on your ring. Plus, it is so comfortable you can easily forget you have it on. 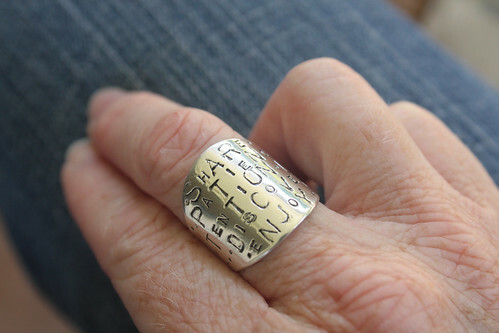 Wendy is a jewelry maker and is starting up her own business called Homefront Metalworks. For the time being she’s showing her work through Facebook, but look for her Etsy shop to be up and running in the near future. Homefront Metalworks also has customizable bracelets and necklaces too. For Valentine’s Day, hubby bought me a dog-tag style pendant with the kids names, our initials, and “live, love, sew” in addition to a few pretty jewels. Stitch some. Add another color. Add a third color. Take it all out. Buy something completely different. Stitch some. Try the opposite somewhere else. Prefer that and take out previous stitching. Stitch some. Stitch some more. Prefer previous stitching and take out current stitching. Stitch some with previous color. Add a new color. OK, now I’ve got it. 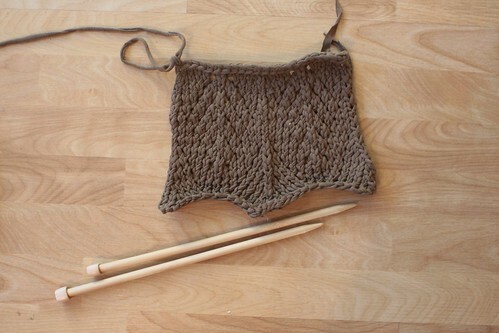 My knitting seems to follow a similar process of knit, rip, knit, rip, knit more, rip some, knit again. 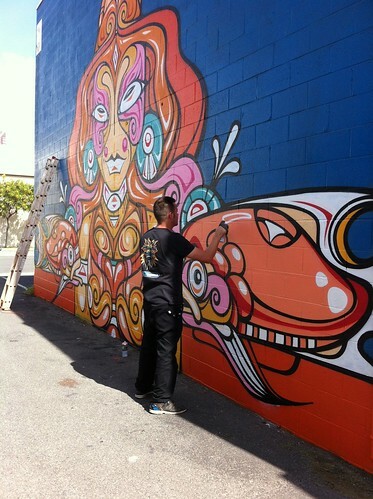 This week was Pow Wow Hawai’i 2012, a “gathering of contemporary artists that engages with the broader community in the process and creation of art.” And engage it did. Our family took the afternoon to watch the international artists at work and to see their incredible creations. 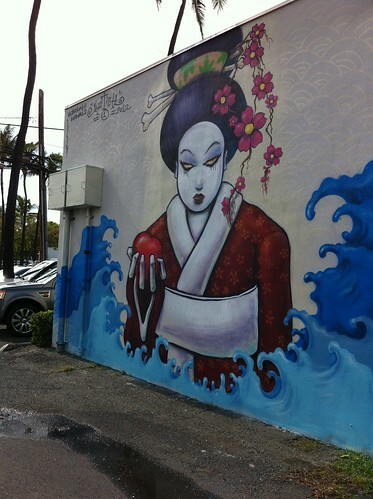 It didn’t hurt that we needed to be in the neighborhood to pick up hubby’s race pack for the Great Aloha Run on Monday, nor that the art was within blocks of Hank’s Haute Dogs (for fortification, of course). Pow Wow hawaii turned out to be the star of the day though. I want very much to share some of the art we saw. Much of it was collaborative and in-process, so please forgive me if I have not given sufficient credit to the artists. 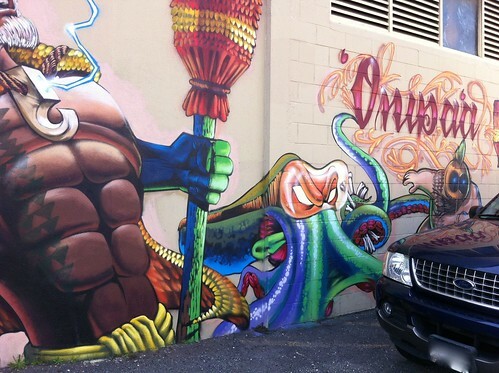 I figure that since the nature of most street art is anonymous, just sharing the amazing work is acceptable. 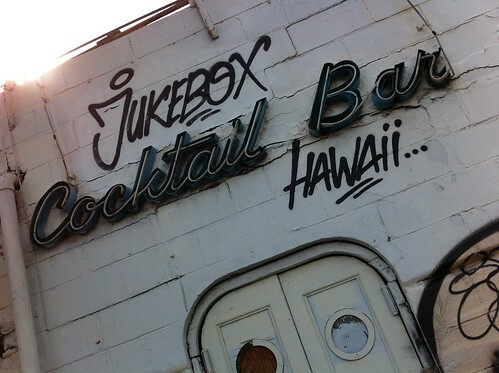 I’ve given names where possible, and more info can be found via the Pow Wow Hawaii link. Click on the photos to go to my Flickr pics which have a little more info. Hubby has more photos on his Flickr pages too. 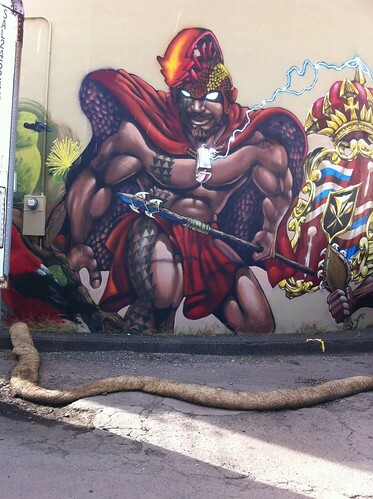 This guy is part of an impressive corner mural depicting the Hawaiian coat of arms. It has a lot of legend and symbolism imbued in it, and man, the painting is good! Disclaimer: I’m not entirely sure if this is new, or from last year’s Pow Wow. I think it’s new. 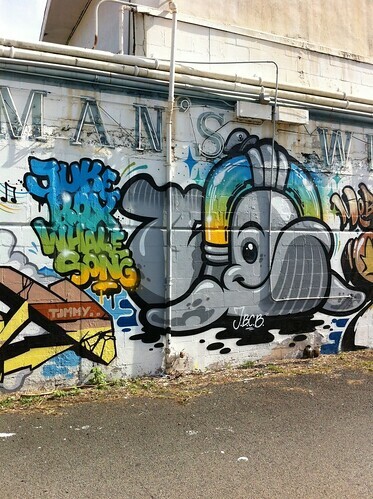 This section is Kame’eiamoku and a he’e painted by Estria. Not far away is a huge wall depicting gods and goddesses of Hawaii. I forget who they all are and what each symbolizes, but it’s always in pairs such as heaven and earth, fire and water, air and snow, etc. Pele is easy to find, and I liked Lono riding his pigs, but snowy Poliahu was looking great as well. As I was talking to one of the artists and not getting all the names straight, he said this is why they wanted to make such a mural: to be educational as well as beautiful. 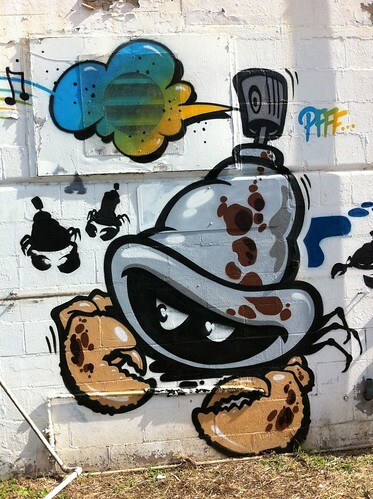 Some of the artists participating in this collaboration were Estria and Trek Six and probably Prime. 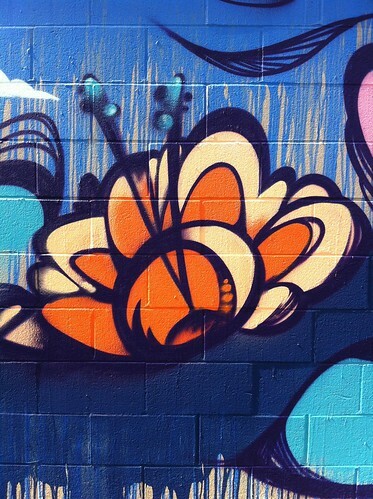 Another cool he’e by Estria. 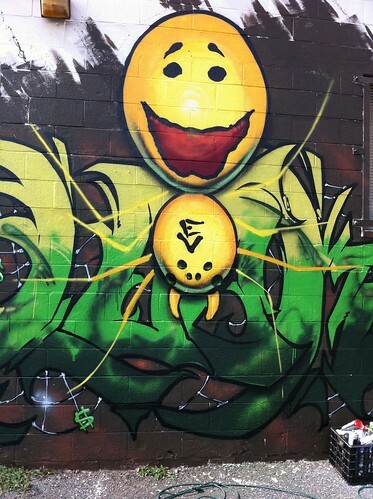 The Happy Face spider is endemic to Hawai’i. The kids figure this one is happy because it’s on a web of cash! 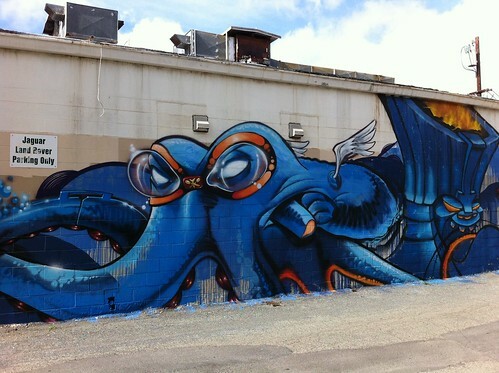 Further down the wall with the octopus and the spiders is this dangerous looking love by Katch. Again, I was really impressed by the quality of the artists. Damn, they can draw! 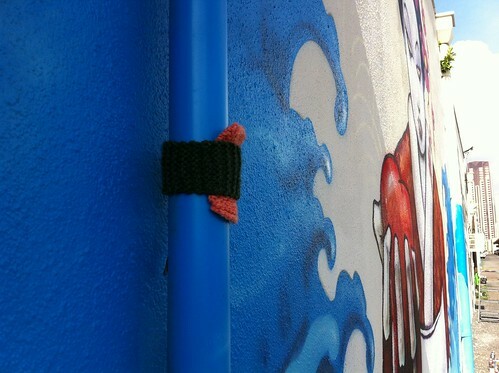 My knit buddy Michelle got in on teh action too and tagged two pipes with spam knitsubi! 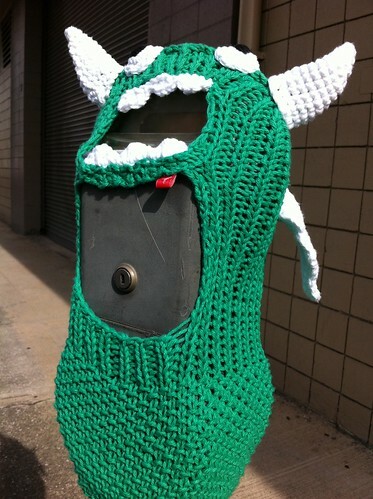 And there’s a Hannasaurus rex on a nearby parking meter. Feed me! It was hard not to be drawn in by the art. At first I thought this was a unicorn fish, but the kids pointed out the string hanging down and informed me it was a party fish. 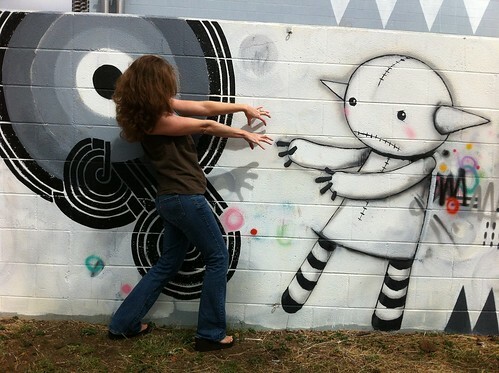 Around the corner from the fish and zombie-esque cutie were a bunch of local artists mashing it up. The theme at this end was mauka to makai (mountains to the sea), and as it was facing a park, it was somewhat sporty. Above are tattooed cliff divers and below are menehune racing pigs. I love the iconic ’40s style menehune (something like fairies) on their fluffy boars. Looks like wonderful pandemonium to me. Fisherman’s Warf use to be a destination restaurant. Now it’s a derelict building on a main thoroughfare. 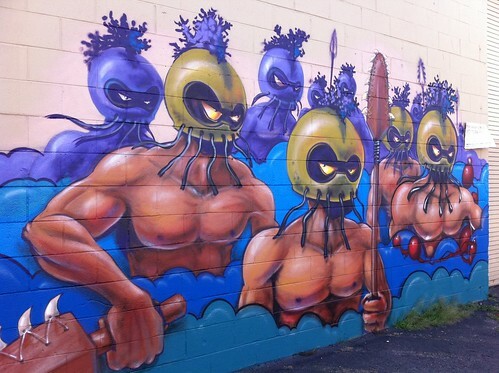 As of this week it’s been made more interesting with a happy melange of graffiti by Flying Fortress, 123Klansman (scien, klor, cleo, & tommy), and Moby Slick (I think). 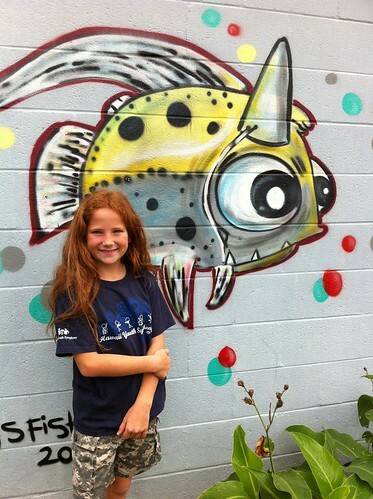 Australian artist Phibs ended up with his own wall which he filled with this graphic red-head. It was amazing watching him paint. He made flowing lines so effortlessly and gracefully. I think this wall was the collaboration to end all collaborations. So many artists worked together on it and they blend and overlap so interestingly. Everyone seemed to be having a good time too — watching each other work, adding bits here and there, and checking out how each site was growing. Participants include “Angry Woebots” who painted the angry pandas (which he says counter the popular image of cute pandas and could be mad because they are endangered), Peap Tarr, Meggs, Barras, Jago, Aaron De La Cruz and Jeff Hamada (I think). 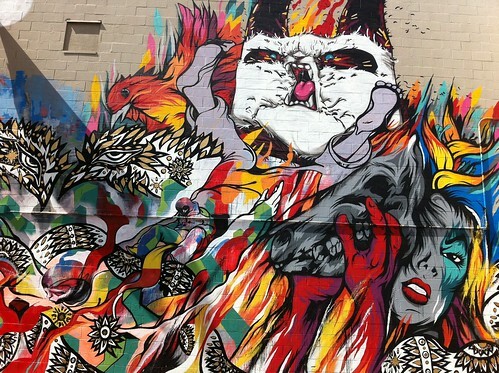 I’m not sure whose brainchild this one was, but it was basically a funky cat with a bunch of characters in it’s mouth. Angry Woebot is adding a panda to the mix. But the coolest thing was how the cat artist had used a cement overhang as the bill to the cat’s baseball cap. All in all it was a great way to get out of the house, interact with the community, see some fun art, and have a nice family outing. there were lots of others out enjoying the Pow Wow too. I hope that they are able to continue this event to both engage locals and to add character and beauty to otherwise dreary neighborhoods. This one is a bit of a spoiler. Last week was my mom’s birthday. I always have a hard time deciding what to get her since she has what she needs and doesn’t yearn for lots of luxuries. Her husband was planning on bringing her out of the 90s with a new iPhone though, so at the last minute the lightbulb went off and I knew I had to make her a cool iPhone case that reflected her love of the Arts & Crafts style. For Christmas (or was it MY birthday? ), I had actually steered her towards buying me a cool DIY cross stitch phone case kit like I had seen on the Purl Bee blog. I have not had time to work on mine (lime green with dreams of a mushroom motif), but that’s beside the point. I rushed over to Purl Soho and ordered an appropriate kit and told my mom on her birthday that I would make her a case — just so she wouldn’t go out and buy something else. So, she’s kinda knows already what she’s getting. Which is why I’m willing to show it here. The kit arrived mere days after I ordered it (yay Purl!) and I got right to the designing and stitching. The kit comes with a few designs to choose from and some floss. Purl Bee also has instructions to replicate their designs. Plus, googling “cross stitch phone case” brings up some other ideas online crafters have come up with, for those looking for inspiration. I downloaded a blank cross stitch grid and marked out the appropriate number of vertical and horizontal squares. Then, I drew my design in the same scale, but on another piece of paper. Finally, I taped the grid over the final drawing, held it up to the window (my quick and easy light box), and colored the appropriate boxes based on what was underneath. While this is not a huge project, it did take a good three days to stitch. Those little crosses are pretty tiny. I used only two strands of DMC floss, and a few accents of a gold floss from my local stitchery shop. It was completely worth it though — not just because it’s for my mom, but because I think it really turned out great. I doubt there’s any other Charles Rennie Mackintosh-inspired phone cases out there! Anyway, Happy Birthday Mom! This is already on it’s way to you. I am so easily distracted! Thursday night is knit night and this week I wanted to go but didn’t have an easily portable project (I’m working on an afghan, but it needs a new color each row and I don’t like to schlep my box of yarn around). It struck me though, that I could cut up some newly discarded army undershirts of my husband’s and swatch some lace patterns. Perfect! First, a little back story. 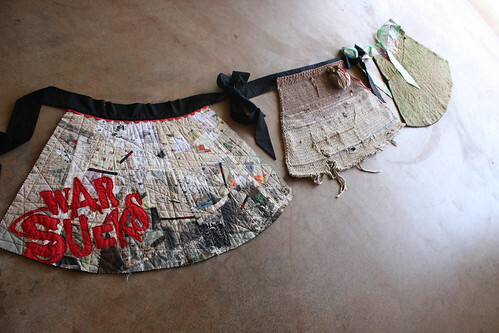 When I started the Army Wife series of aprons (now to include other textile forms) I wanted to express the feeling of unravelling with a knitted piece. This is me trying to work out the increases to shape the piece. But it was just a trapezoid and lacked the graceful curve of subsequent aprons. Looking at the growing series together, the trapezoid stuck out like a sore thumb. So I ripped the stitches out and started over. I was still stuck on leaving the bottom edge unfinished to show the unravelling and so the second try was knit sideways, lengthening and shortening the rows. Blech! I set this one aside because I ran out of shirts, and wanted to use hubby’s post Iraq throw-aways. I am hoping that because of the different water and detergents there, the tan color will be a different shade. Those shirts are still in a footlocker on a ship. Still, this is ugly. The apron needs some femininity. 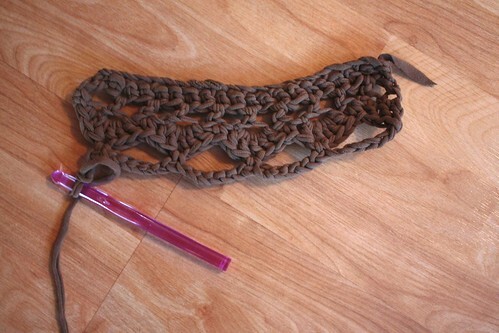 I decided that what it needs is a lace edge. Luckily, hubby purged his brown shirts that went with the old BDUs (as opposed to the tan shirts that are worn with the current ACUs and new Multi Cam), so fast forward to Thursday night when I decided to swatch in brown while I wait for the other tan Tees. First try was a the simple Feather and Fan pattern. I’ve had great success with it in scarves, but the T shirt yarn knits up dense and the laciness was lost, even when I went up several needle sizes. What I needed was something with more holes. 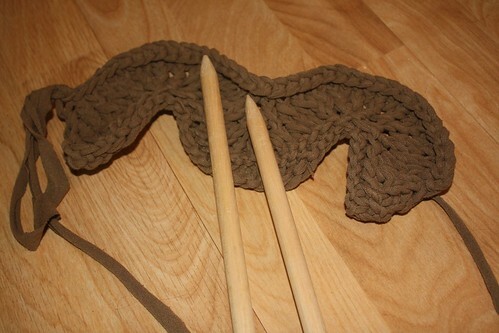 How about crochet? That’s pretty holey. I kinda like that, but I’d rather make the lace border and then fill in the rest of the knit apron shape than make the apron shape first (which I’ve proven is difficult for me) and then add on a crochet border later. I know it doesn’t make a lot of sense, but it’s how my brain works. I’m much more visual than mathematical. 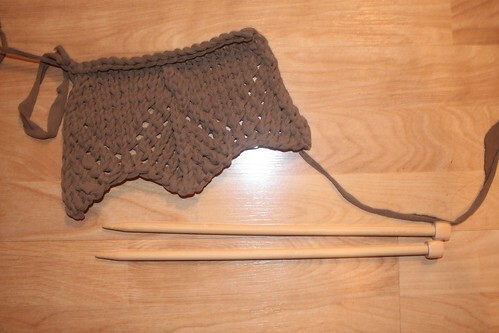 I searched Ravelry for bottom up, curved shawls with simple lace borders. 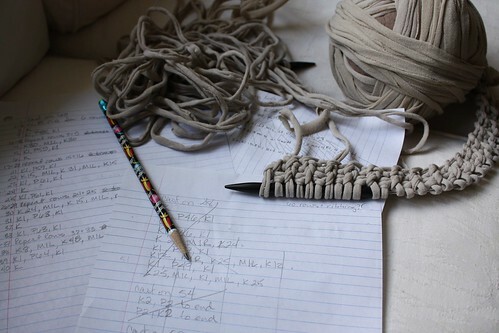 Knitting lace from charts scares me, but I found one that had symbols I knew and just jumped right in. Hey, it’s not so hard! This looks good, but I wonder if there’s an even holey-er I could try? Knowing I could tackle the pattern, I dropped the money to pay for a downloadable pattern and tried something a little fancier. It ended up not being any holey-er, but since it’s wider I think it fills the apron nicely and will make for a prettier piece overall. 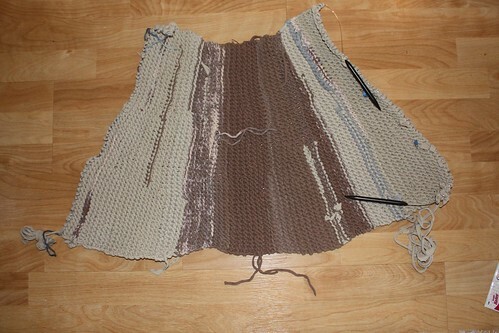 My plan now is to knit the lace part in brown and fill in the rest of the apron body with tan. If I need more tan, hopefully the footlocker will arrive by then. I’m torn though, finish up my Twelve by Twelve metamorphosis piece, or my invitational piece, or keep running with this lace momentum? Squirrel! I am one of the lucky who have a dedicated studio space and a door with which to hide it from the world. But I traded it in six months ago for the opportunity to host a foreign exchange student. 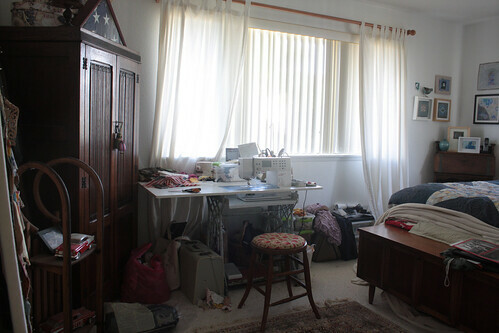 It was totally worth it, but now that our student has returned to her permanent home, and our post holiday visitors have left, it’s time to reclaim my sewing space! 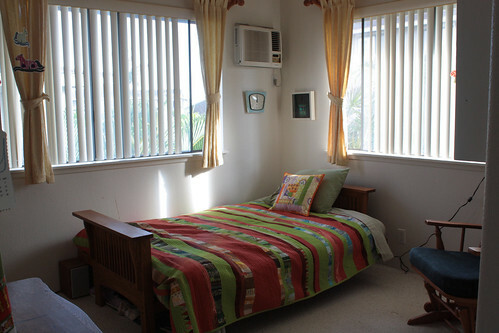 Here it is as a bedroom. What can’t be seen is the closet that is 2/3 empty for the use of our temporary teen. All the “stuff” moved to my bedroom. 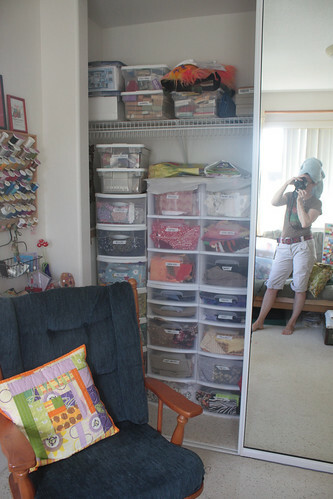 Here it is, but with all the fabric bins already removed. 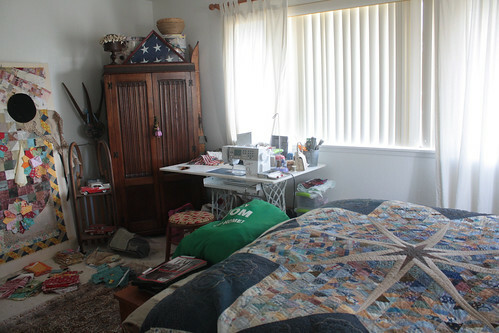 The space behind the “design wall,” and the space under the window was filled with bins of fabric. 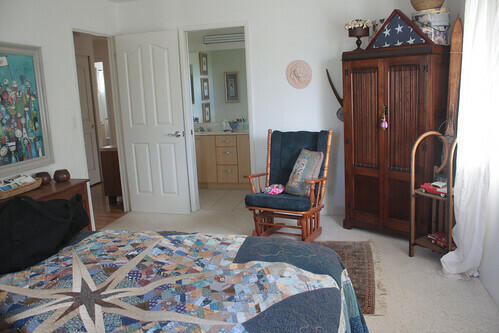 Luckily I had the room to myself as hubby was deployed during most of the time the bedroom was serving dual duty, so I could be as messy as I could tolerate. 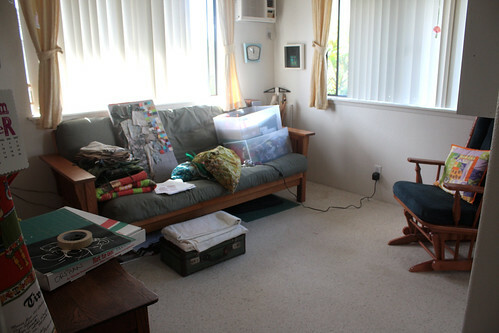 In progress, the guest room futon is back to sofa-mode, and the stuff is moving back in. I took some time to organize and purge my magazines and ephemera on the book case. 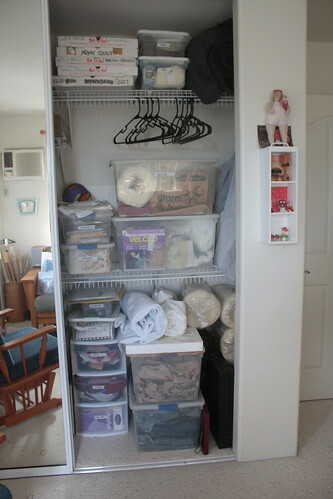 The BIG DEAL: a purged and tidy fabric stash! I have learned to accept that I will always have a large amount of supplies to schlep wherever we go, but I think that confining it to just one closet is a good nod to practicality. Here’s the other side of the same closet. I’ve arranged everything so I’m no longer pulling heavy stuff down every time I need something. 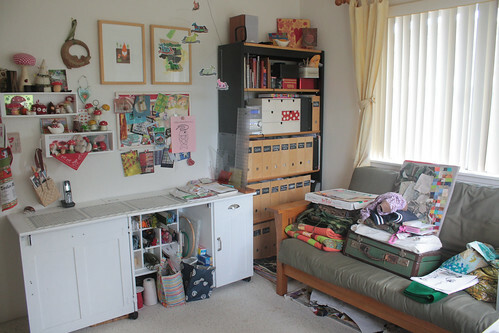 With half of my stuff in the bedroom and half in the “studio” room for nearly a week, I was going crazy, so I set aside all my in-progress projects and finished the move. My cutting table isn’t ideal, but it’s what works in this room. 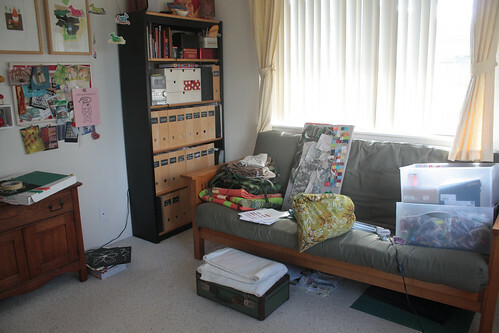 I hope to decrease the piles of stuff on the futon soon! Ahhhh, my sewing machine in it’s rightful place. 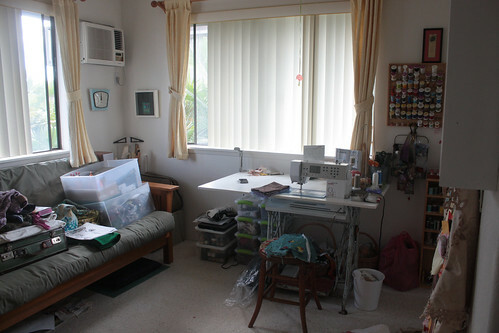 And I forgot just how huge our bedroom is when it’s not filled with bins of fabric and a sewing machine! Now, back to work as I have several looming deadlines, and now I have a dedicated space in which to reach them.